This freeware software allows you to manage your video library on DVD, Divx, HD DVD, BLU RAY, VOD or VHS media. 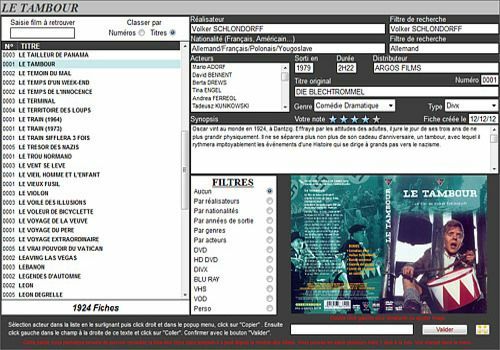 The input of film information is done automatically via the Internet from the Moviecovers website but can also be done manually if it concerns personal videos or TV series not available on Moviecovers. Many search criteria via filters are available. In this version it is possible to export HTML questionnaires to the storage medium of your choice. The Cut - Copy - Paste functions are now done from the right mouse click. A resolution of at least 1366 x 768 points will be essential for maximum working comfort. This version is not compatible with the MovieTek version of the database because the databases are different. The database engine, essential to the operation of the program, can be downloaded from the author's website.